Last week the BMF, along with other marine businesses, celebrated the formal handover of Muchelney's rescue boat, which has become a momentum of goodwill and support within the industry. During the floods in 2012 the village of Muchelney, in the heart of the Somerset Levels, was completely cut off from surrounding areas. In response the local marine companies got together to arrange the loan of a boat to transport essential supplies and residents in and out of the village. When floods hit again a year on, organisers of the London Boat Show and exhibitors joined forces to raise funds and donate a Rigiflex Newmatic 360 Safety Rescue Boat to the village. This included the companies; ADPR, BHG Marine, Garmin, PSP, Rigiflex, ICOM, ASAP, Coleman, Time Inc (formerly IPC Media), Marine Resources, Ocean Safety and Event Broadcast. Today the necessary infrastructure has been implemented to ensure flooding will no longer leave residents stranded. Therefore the community have chosen to handover the rescue boat to BARB Search & Rescue. BARB is a registered charity that operates a life-saving rescue service in the Bridgwater Bay area and was the first on the scene at Muchelney during the flooding. Alastair Mullineux, Chair of Muchelney Parish Meeting said: "A lot of work has been done here in Muchelney and the road into the village has been raised by 4ft, which reduces the likelihood of it flooding again. Everyone is more confident and we're happy to pass the boat to BARB on a permanent loan as a thank you to them." 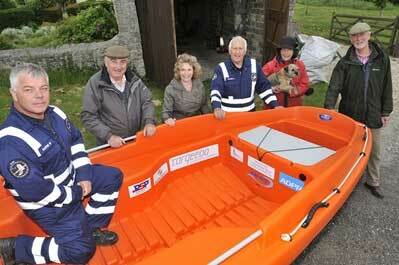 Roger Flower from BARB commented: "The new boat doubles our capacity to help with flooding and rescues. We are extremely grateful to the people of Muchelney for their generous donation and to the original donors of the boat for making this possible."